Kate is now volunteering in Kikima for the next two months. She is teaching elementary school, helping to plan a library at the school for both the students and the community, and helping to decide what is needed for school supplies for the entire school which will be funded by our organization. Kate’s family are sponsors and she is the first of our Canadian sponsors to meet their sponsored child. Kate is living at Ruth and Henry’s home – the site of the Rolling Hills Residence – and walks the children to school every day where she is a teacher. At the end of February, at the end of her time, her father, Fred, will travel to Kikima, spent time at the program and then he and Kate will go on a Safari before returning to Canada. We will let Maya – and all of you – know how this money will be used in the coming months. Aldergrove school, under the direction of teacher Cathy Jackson raised $500.00. Here is how they did it. While reading aloud your novel, Alexandria of Africa, the students in my Grade 6/7 class here at Aldergrove P.S. knew that they wanted to help out an African village like Ruth’s in Kenya. When we found out that you actually created a foundation to support such a community, it was a perfect fit. Our school-wide fundraiser was a huge success. After promoting the event through posters and announcements, we sold dozens of gently used books and treats, along with 600 samosas! Our goal was to raise $500 for the Kenyan community, and we are happy to say that we met that goal, along with some extra money that we can send to Haiti to support the earthquake victims. Alexandria’s lesson of “thinking of others before herself” was put into action right in our classroom! So, once again, thank you for your time and inspiration. I was very inspired when Eric came to my school to talk to us about his charity, the Creation of Hope, so I sent an e-mail to my friends and family saying that instead of Christmas presents, I would like donations for the charity. When Christmas came, I collected all of the money from my relatives and friends, as well as the money I, myself, had been saving from babysitting, and managed to raise about $465.00 in total. I am very excited to see the results of my donation! We sincerely thank you Emily for your caring. We will be updating you on how the money will be spent on this web site. Please keep watching. Mr. Rumsby’s class at Prince Phillip raised the rest of the money for the Goat Academy – they sent in a cheque for another $535.86 to complete building of Rumsby’s Kids’ Goat Academy. That one class has over the past few months funded the building of a well that has given fresh water to 700 people and funded the construction of the Goat Academy. Pretty amazing. The Global Perspectives Program at Innisdale Secondary School recently held a ten year reunion and raised $700.00 for the Creation of Hope Foundation. In the coming months we’ll post on the website what this money is being used for. Thanks Innisdale and Rob Ruttan! Ruth and Anita Walters visited Innisdale in October to share the story of Creation of Hope with the students there. The raised an honorarium for Ruth and followed through later with this effort. At Sir Samuel Steele P.S. in Whitby, Ontario, students in Grades 7 and 8 have formed a Creation of Hope club. Before Christmas this group sold candy canes to raise money and they were able to collect $217 to donate to the Creation of Hope. This is the second year for our club. Our 23 members plan to continue to organize events within our school to support the Creation of Hope! Hamzah Rifai a student at Sherwood Fox P.S. in London donated $20.00. 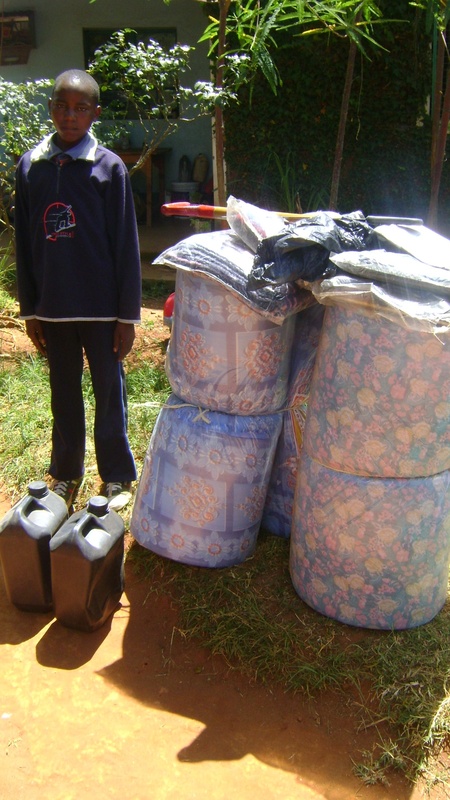 This money was used to buy four blankets for one of the new sponsored children, Muthama Mbithi, listed below, along with his cousin, sibling and grandfather. At the end of a presentation at Glengrove Public School two young ladies handed me $2.75. This will go toward a blanket. I love when somebody reaches right into their pocket and in the case of these two young ladies they gave all that they had . . . what could mean more than that? We also received a contribution from Lancaster Drive Public School in Kingston. Here’s their story. We hope that you will accept the givings from our class towards ‘The Creation of Hope’. We were very impressed by your talk at Lancaster Drive PS in Kingston and we decided that we would like to contribute to the people of Kenya. The Grade eight students in Mr. Wilkins’ class raised the money by imposing a ‘Christmas tax’ on students in our class who wished to wear a Christmas hat or other holiday festive wear during the month of December. It was a lot of fun and we got many contributions each day that someone wished to wear a seasonal hat or scarf etc. in class. Students were to drop a quarter in the collection jar for the privilege of dressing seasonal. Many students contributed a lot more than the quarter and that is how a class of 24 was able to contribute $179.00! 4 goats, 2 chickens and 1 blanket. Thanks you for your great work and allowing us to see the need and to do something to help out. We already used the money for four goats for Rumsby’s Kid’s Goat Academy. The milk from these goats will go directly to the residents of Rolling Hills. We used $318.00 of the money raised by Cupar School to construct the building to store grain and feed for the goats, rabbits and chickens. 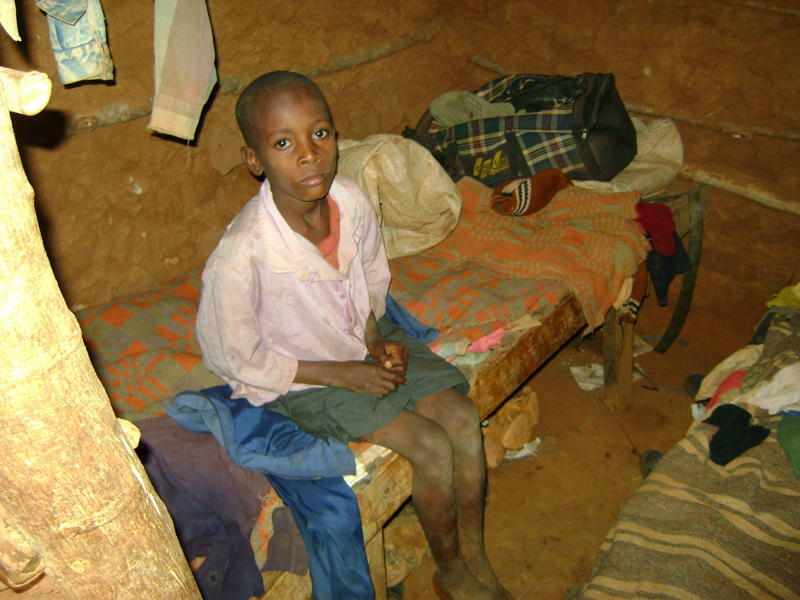 One of our newly sponsored children, Muthama Mbithi, was in a desperate situation. We provided two mattresses ($36.00), a new school uniform ($12.00) and a pair of shoes ($10.00) as he had no shoes, two rabbits ($7.00) and a tool set ($16.00). This money was funded from Cupar as well. Every two weeks there is a food distribution in which sponsored children, their guardians and often the siblings and cousins of the sponsored children, attend. Ruth and Henry provide a meal for all and give out the food packages. Monthly, the amount of money we collect is less than the amount given out and we have a shortfall. For September, October, November and December the amount of additional money was $455.00. We have used additional funds from Robert Southey School to cover this shortfall. Food distribution takes place every two weeks. $392.00 of the money from Cupar School has also been used to purchase 1705 saplings. This is the final instalment in the 8100 saplings that have been planted. They are a mix of fruit trees, shade trees, medicinal trees and trees that will ultimately be harvested for their lumber. I have been very fortunate to have re-established contact with my Grade 5 teacher – Miss Gay. She was the person who first told me that she thought I could be a writer when I grew up. She has made an incredibly generous personal donation and we’re going to start to use that money – in conjunction with $500.00 raised by Ray Lewis P.S. – to build the library in Kikima. In honour of my former teacher it will be formally dedicated upon completion and called The Christena Gay Library. We’ve had an ongoing commitment to water projects. Water – especially fresh drinking water – is one of the keys to life, health and ongoing prosperity. We made a decision to create special bio-filters that could purify water and make it safe for drinking. These bio-filters are concrete shells containing special layers of sand, gravel and stones and have pipes to drain the filtered water. By simply pouring in dirty water at the top, clean water is filtered out the bottom. This was a very complicated process, involving making moulds, understanding the principles, and casting the very first biofilters. This initial process cost $810.00. The very first biofilter has been placed at Exodus Children’s Home for the use of the children in this setting. We funded this project by drawing money donated by Robert Southey school. 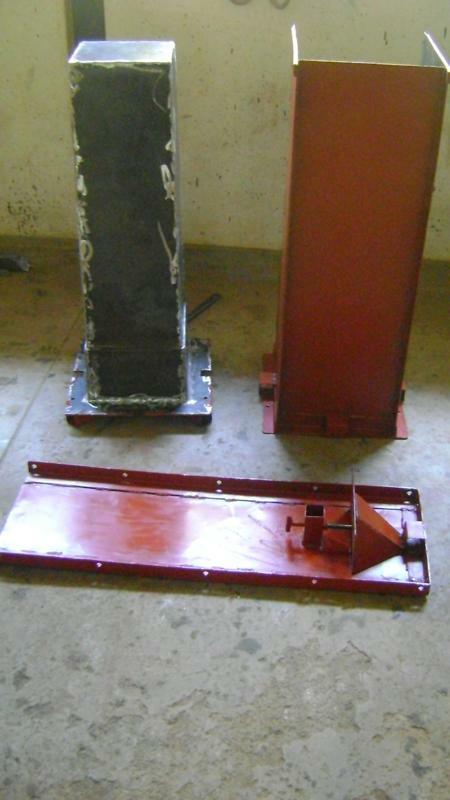 When this project is in full tilt we will be making bio-filters and distributing them on a micro-loan basis to needy families, schools and businesses – asking only enough money to pay for the concrete and the labour. We hope this will ultimately become a highly successful micro-business in Kikima. One of the best ways out of poverty is to provide jobs! 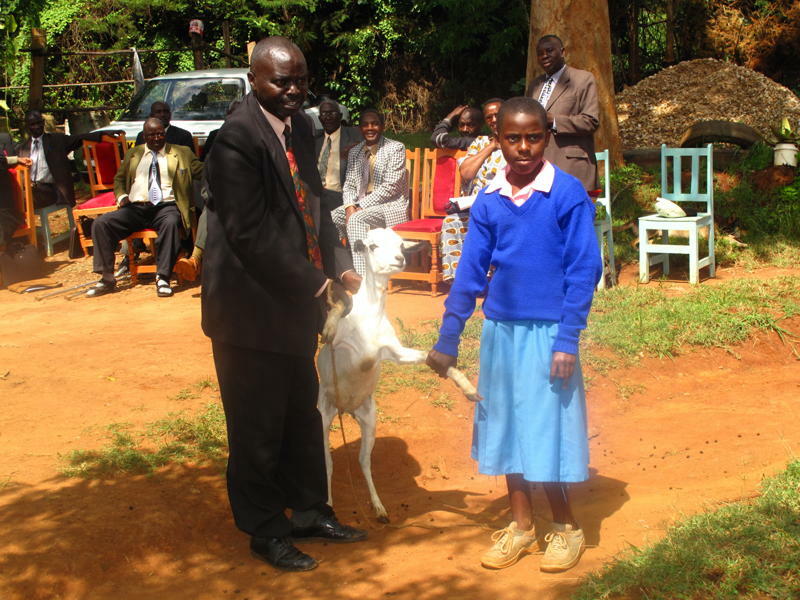 A goat for Faith from Rumeet – a present for one of Rumeet’s friend. One of the most exciting projects we’re involved with is a partnership with Rumeet Toor to create a faculty of education in Kikima to train local people to become rural teachers. 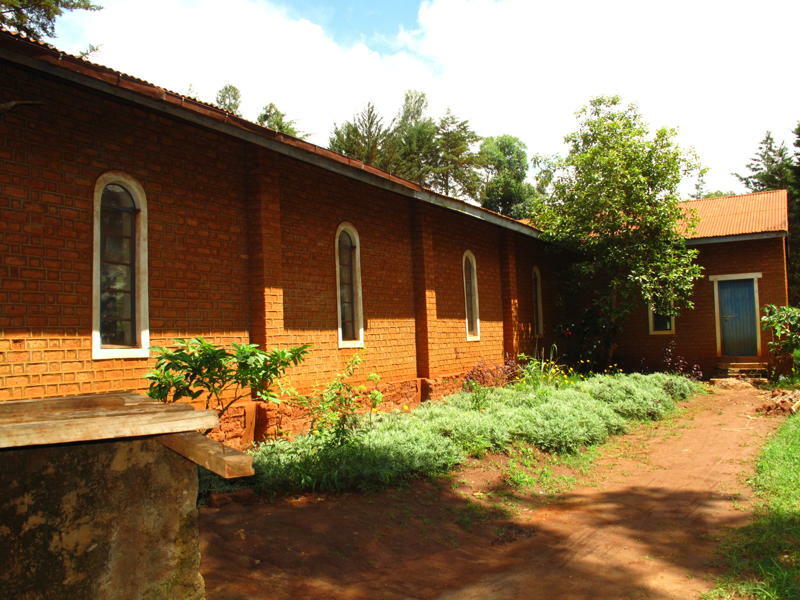 Rumeet is providing the funds for the renovation and creation of the building while we are supplying the people on the ground – Ruth and Henry and the same advisory group that supports Creation of Hope, and our partnership with AIM to transfer the money to Kenya for the project. 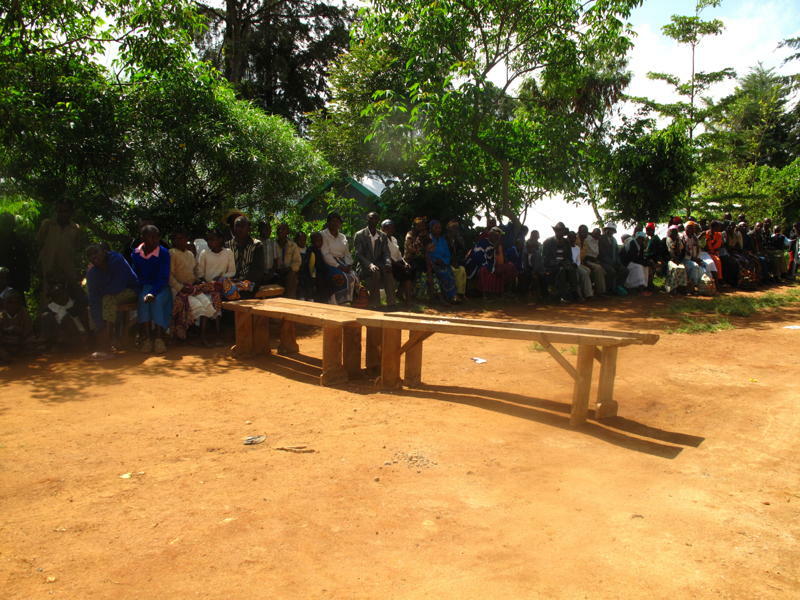 This is an example of good people working together around a good idea for the betterment of the people of Kikima. Please go to the following website to see more about how this partnership began and continues to evolve. The church community donated the building and Rumeet funded the renovations. Side view of the educational facility. It is hoped that it could be opened and operating by the end of May with the first students training to become teachers! One of our sponsors – Lorraine Toma-Jones donated a laptop computer that Rumeet brought over for use at Rolling Hills. Here’s a thank you letter from the kids for Lorraine! This has been a month of goats. There were goats given as Christmas presents to orphans in the community, and goats given to populate the Goat Academy with the milk being consumed by the children of Rolling Hills Academy. Twenty-eight goats were donated in total– at a cost of $40.00 per goat – for a total of $1,120.00. 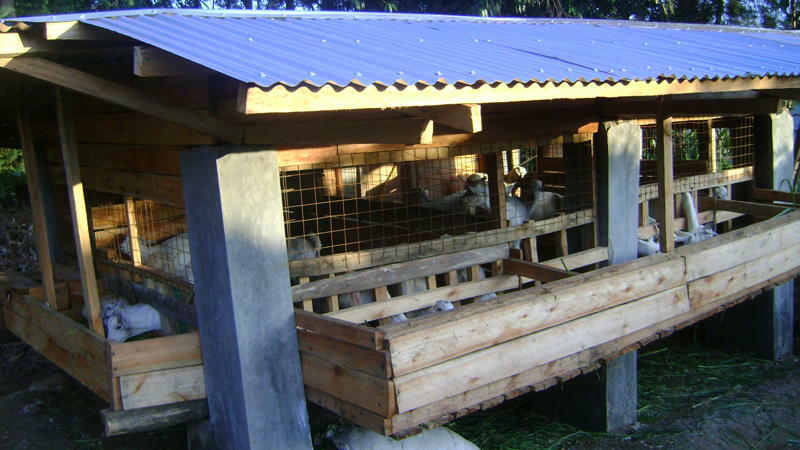 There are now twenty-three goats in the Academy, providing fresh milk for the Rolling Hills Kids. These are the purchased goats including the 5 from Christine, 5 from Graham and the 4 from Lancaster Public school. This has had an amazing impact on the community at large and the daily food intake of the children of Rolling Hills. Give somebody a goat and you give them milk for life. 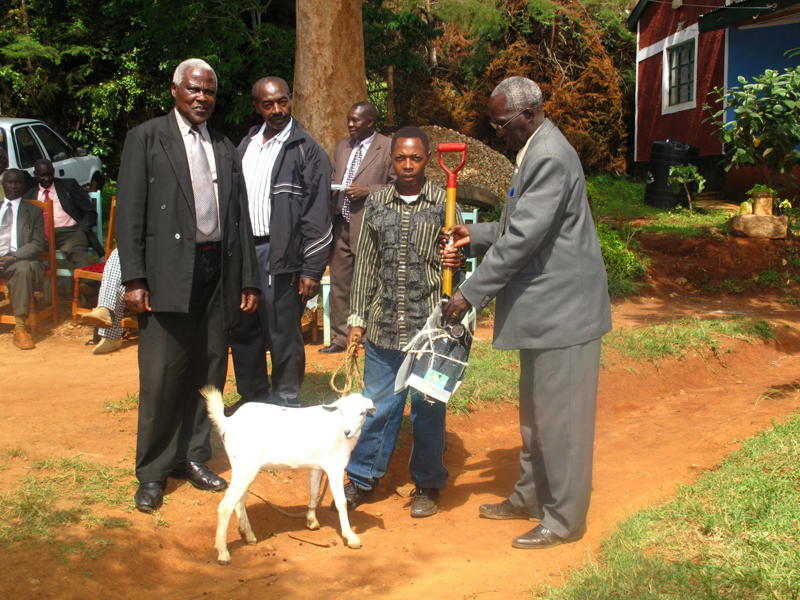 Musengy’s brother receiving a goat and tools – ongoing outreach to the community. 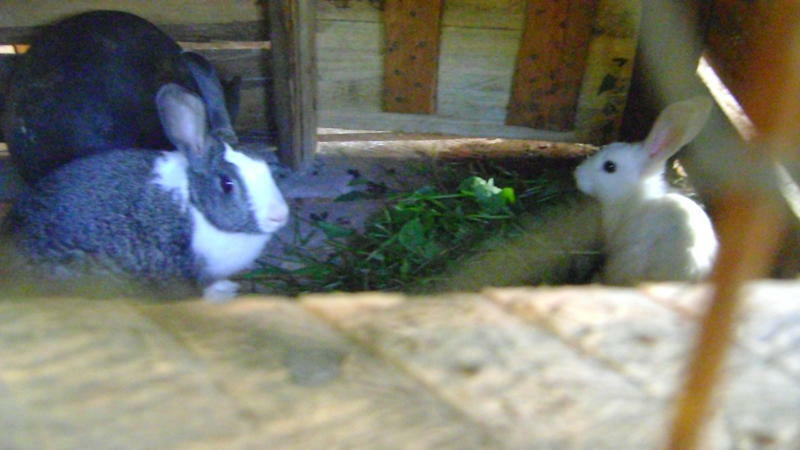 Rumsby’s Kids Goat Academy has also become the home – on the ground floor – to a rabbit hutch. This is an exciting program that will help provide for the children while working toward greater self-sufficiency. The first few rabbits . . . soon to be a whole bunch of rabbits! A 40.00 donation from Christine Bonsall was a present for her sister-in-law Mary Anne Watson-Bonsall. That $40.00 became another goat and pictures have been forwarded to Mary Anne to pass on to Christine. Brookside Secondary School in Cobourg, Ontario raised $120.00 through the Hospitality class’ bake sale. They have asked that this money be used to purchase goats. Three goats will be purchased with this money. Thanks Brookside for caring! Special thanks to our friend Kathy McTavish for a $50.00 donation. Instead of two hostess presents at Christmas, she let her hosts know that she donated money in their honour to Creation of Hope instead! As part of Christmas donations from our wonderful sponsors we purchased both new school uniforms and special Rolling Hills uniforms that the children wear when they are out in the community representing the children’s home. All of the children now attend the same school – the same school where Kate is volunteering her time as a teacher. As well all of the sponsored children were bought new clothing and shoes for Christmas – an incredibly generous contribution from the sponsors. The children received clothing, uniforms, shoes, text books, and some toys and sports equipment. Ruth also requested that we use some of the money for medication. 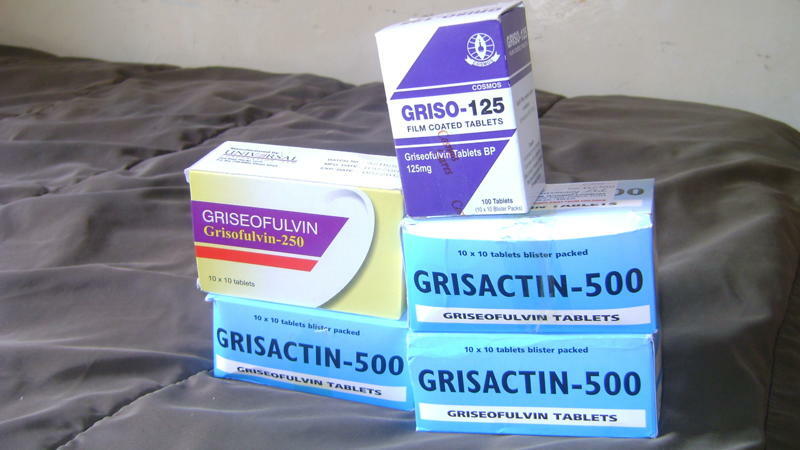 Ringworm has been an ongoing problem and some of the Christmas money was used to purchase medication. And, as always, Ruth sends us pictures of everything. New Sponsors and sponsored children! Before we talk about new sponsors we have a few words from one of our longest standing sponsors – Michele – a young lady who knows about helping and giving. My family and I are very pleased to sponsor a little girl named Faith. Faith is a focused girl academically and in life. She has a dream of becoming a doctor one day and my family and I are so lucky to know her and help her to achieve her future goal. 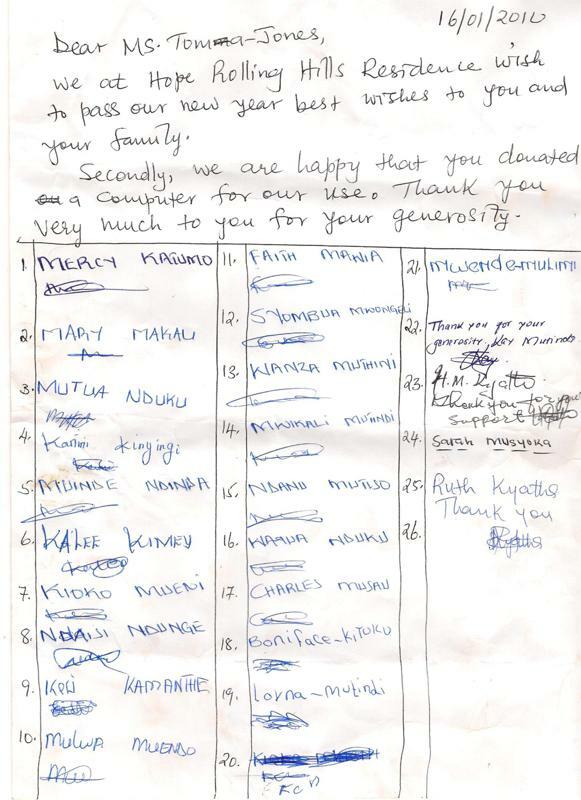 The Creation of Hope project, means a lot to my family and I as Eric and Anita have put countless hours into engaging sponsors in every aspect such as e-Newsletters, correspondence with Ruth in Kenya, receiving and exchanging hand written letters and pictures; which certainly make you feel connected. If you are looking for a rewarding experience, where you can make a difference in someone’s life, The Creation of Hope project has a lot to offer. After all you can be a sponsor too. This month has brought has 5 new sponsors. 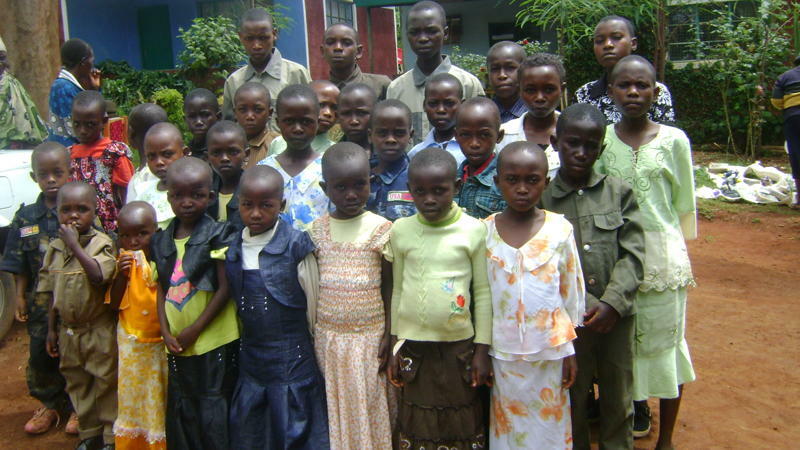 Below are pictures of the sponsored children and a brief note about their situations. Amy Black is one of my editors and she decided that she and her family would become sponsors for a child. Here is their child. Syombua was born in 2002, her exact date of birth is not known. She is in standard (grade) 4 and lives with her elderly grandfather and 10 other siblings/cousins. The grandfather is not able to provide adequately for this large family. This however, has not stopped Syombua from performing well in her studies. In the previous exam, she scored 525 marks out of 600. We believe her potential can be achieved if she has someone who believes in her, such as you have chosen to do. Syombua doesn’t have a bed and sleeps on a mattress on the floor, which was bought by Eric during a previous trip in August 2008. She is a clean girl but looks malnourished . Her wish list includes food, shelter, a bed, clothes, books and education. Mutunga Ndile was born in 1998 and is 12 years old. 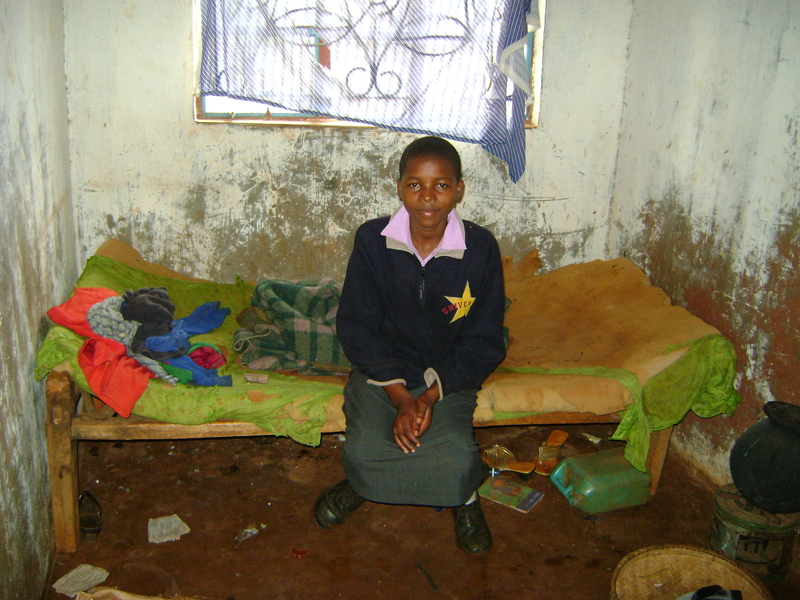 He is in standard 5 and lives with his elderly grandparents and older brother, Wambua Ndile, who is in standard 6. They have 1 ½ acres of land on which they plant maize and beans. They also have 11 goats and five cows. The guardians barely make enough money from casual labour with which they can adequately take care of everyone. When things become financially tight for them, they are forced to sell some of their land. Their house is made out of mud and has iron sheets. Mutunga shares his bed with his brother and they have only one blanket to cover themselves with. This bedroom also serves as the kitchen. 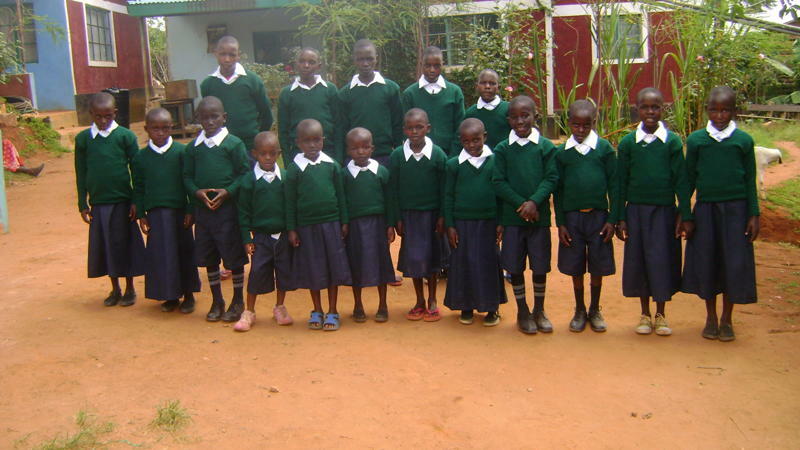 Mutunga is a bright student in school and was position 10 out of 65 students in his class. 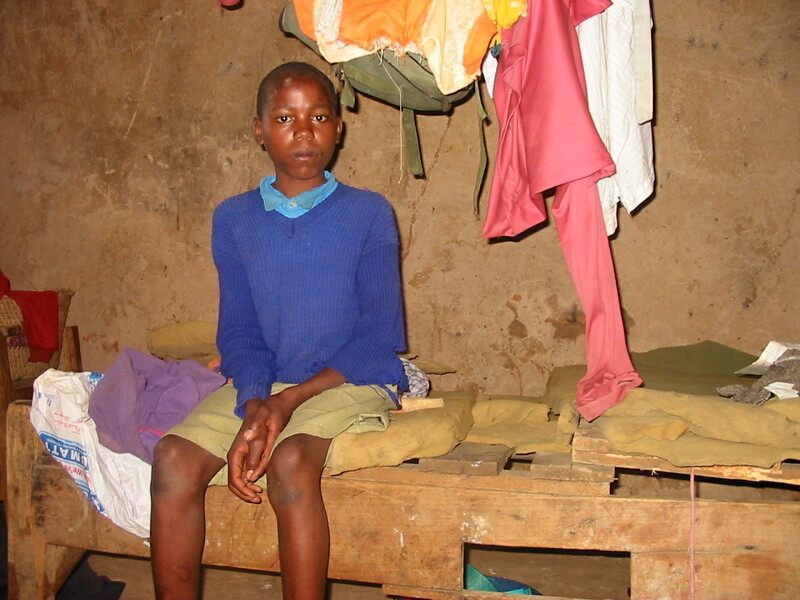 His wish list includes books, stationery, clothes, school uniform, school bag and a towel. The grandfather has been sickly after an accident and the church has been helping out on his treatment. He once wrote an agreement letter to the head teacher, handing the children over to the school administration. 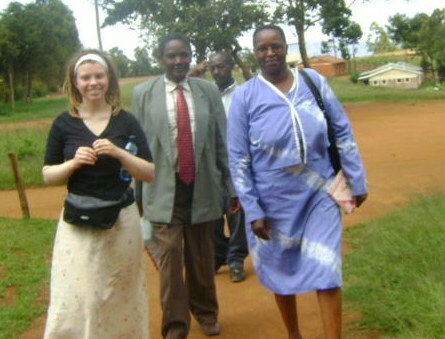 Mutunga’s sponsorship was brought about because Lauren heard me speak at her school and her heart was touched. She talked to her family and now the Vanbetlehem family are Mutunga’s sponsors. 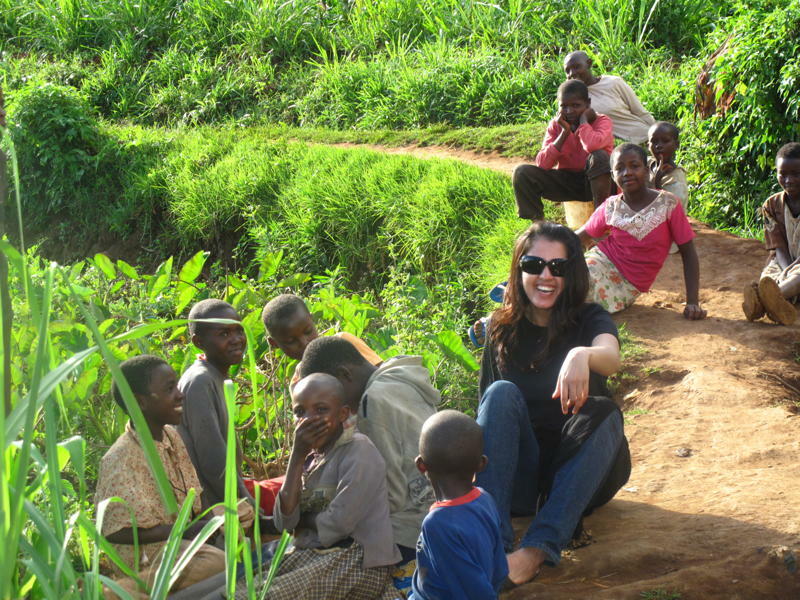 Deanna Sauls and her family have taken over the sponsorship of Mueni. This little girl was one of our first sponsored children. This little girl, just over two at the time of our involvement was on the verge of death. Subsequently with ongoing involvement she has been doing remarkably well, growing, making gigantic leaps in speech and mobility. Ruth recently arranged for her to be seen by a doctor. Contrary to what we all had assumed – she was not HIV – and her previous state was as a result of significant malnutrition and now, with regular food and care, she has become healthier and is quickly approaching normal developmental milestones. 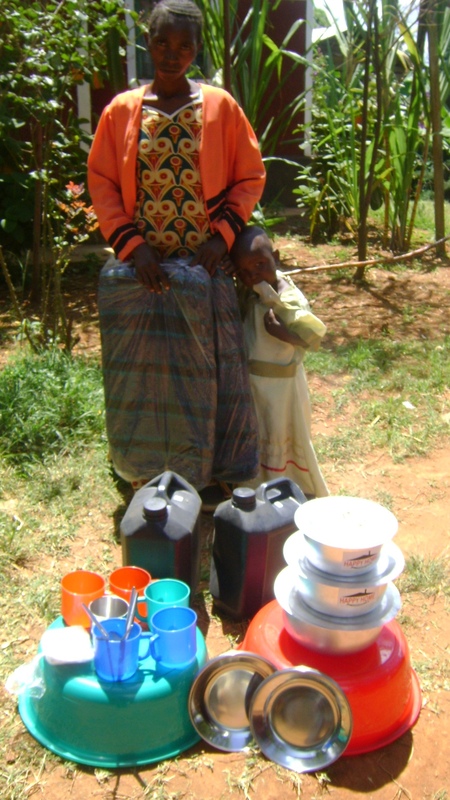 With your generous contribution of $ 90, the following items were bought and distributed to Mueni today. 5 plates, 5 spoons, 5 cups, 2 blankets, 2 wash basins, 2 water containers, 3 cooking pots, 2 pairs of white school socks, a school uniform and shoes (I will email you pictures of these last two items on 6th February, 2010 when they will be ready for collection). My wife and I have always thought that all of the children were ‘our children’, but we have been so impressed with the efforts of our sponsors that we decided to sponsor a specific child. This is Mary, our sponsored child. Mary Wanza Makau, your sponsor child, was born in December 19th, 1995. The father passed away in 1997 and the mother in 2001. The first born sister, who is 24 years old, is the one who is running the household now through casual labour as a shop attendant or wherever she can get a job. She has done a course in HIV/AIDS Management. The second sister has done her form four exams and did not have prospects of going back to school. Mary shares a bed with her sister, though the beddings are in need of replacement. 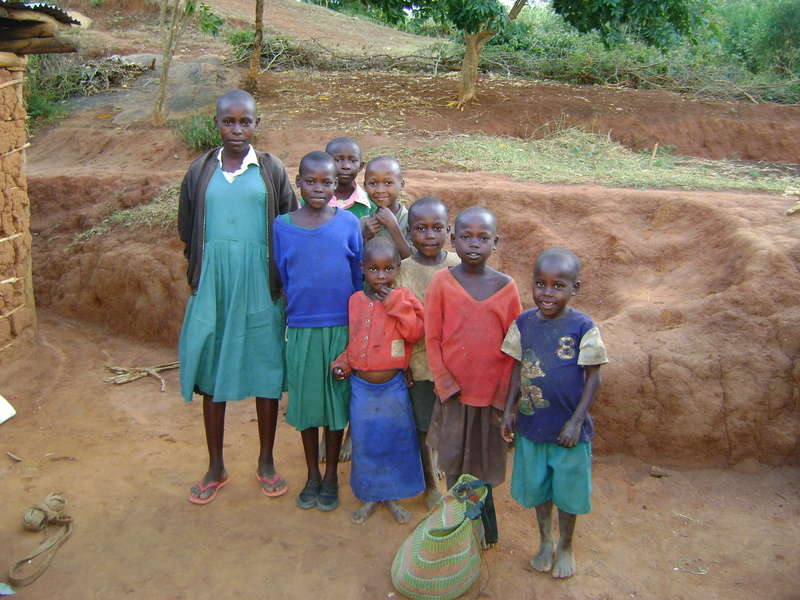 She will be glad to know that she has got a sponsor, which should motivate her to do her best. She did her Standard (Grade) 8 exams last year but did not do as well as expected, therefore, she has been admitted into the Hope Home – Rolling Hills Residence, and with the guidance of a tutor who has been hired to help the children study, she will do even better this year. Muthama Mbithi was born in 1997, his exact date of birth is not known. He is in Standard (Grade) 5 and lives with his elderly grandfather, Nzomo Mbithi, his sister Ndanu Mbithi and cousin, Nzioka Muema. 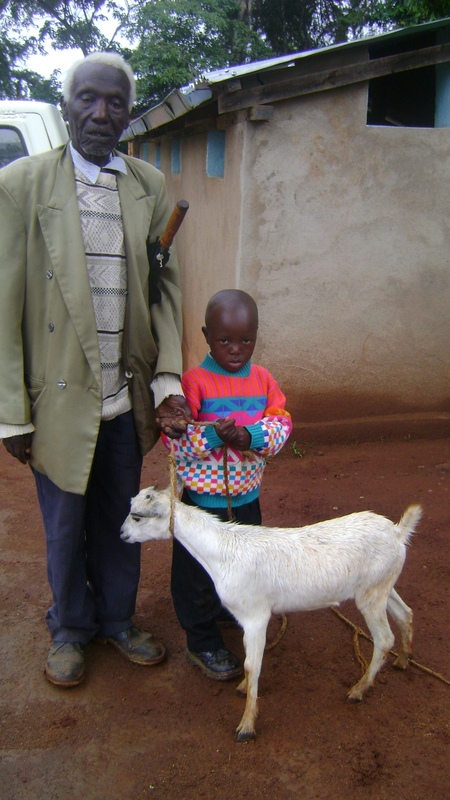 Muthama takes care of his grandfather’s livestock and even has a rabbit project of his own. This is what helps them get by, that, plus relief food or well wishers. He will be thrilled to know that he has someone who believes in him. Muthama shares a bed with his grandfather. However, the bed is broken, the mattress torn and the beddings are inadequate. His wish list includes a uniform, shoes (he has none), clothes, stationery and textbooks. He is a very promising boy academically. At the time of interview, he had scored 404 marks out of a possible 500 and was position 8 out of 34 students. We felt that this family needed an immediate boost of help and the following was provided. We purchased 4 blankets, a pair of shoes, two water containers, uniform, a tool set (two digging tools, a shovel and machete) and two mattresses for Muthama. We gave them to him today and here are the pictures of him receiving the items. We also bought two rabbits from him to add to his hutch. We will be working with this young man to expand his hutch and rabbits. When somebody is this ambitious we need to help him reach his potential. Our own Elijah started everything he has accomplished with a loan for a kilogram of sugar and then credit for eggs – that’s what started him on the road to his university education and the creation of Exodus Children’s Home. They were grateful for everything and were not even expecting all the things they got. 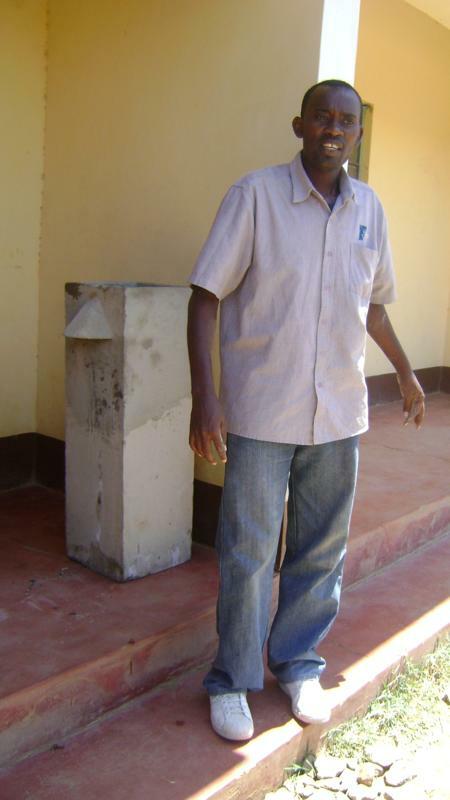 Muthama was measured for a uniform, which he will receive on 6th Feb, 2010, when we will also buy him his pair of school shoes. Muthama’s sponsors are Don and Ann Cooper, who have become involved because of one of our existing sponsors, Marie Campbell – their daughter-in-law. Eric is a quiet 3 ½ year old boy and when he can, he goes everywhere with his 93 year old grandfather, always near him, most of the time, holding his hand. Perhaps he is looking for security, reassurance that he will always be there for him. He was briefly admitted to the children’s home, but went home the following day, because he missed the familiar things about him, so homesick was he. His mother passed away in June 2007 from an illness. She was unmarried and the father is unknown. Eric also lives with his older brother, Muendo Katile and grandmother. They own five acres of land, but rent most of it out as the grandparents are too old to tend it anymore. When they can afford to, they hire someone to tend the coffee, plant maize and arrowroots. They use to have cows but when the grandmother broke her hip, they had to sell them as there was no one else to look after them. Now, the grandmother stays near the home as she can’t walk properly nor for long. 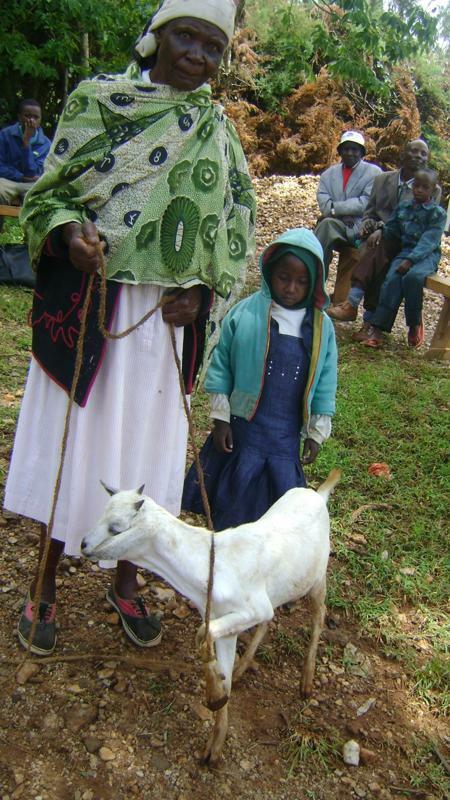 They have been left with one goat which Eric got through another sponsor. They also received a tool kit and tree seedlings. The grandfather supports the family on his monthly pension of $48.33, as he used to be a teacher. The house is made of brick and has an iron sheet roof which is leaking. Eric shares a bed with his grandfather. It is wooden, with a mattress and two old blankets. His wish list includes clothes, shoes (has one pair, the rest are old and small) and education. Through your generosity, he will receive a food parcel every two weeks. Eric’s sponsor are Kelly and Christopher Betts. Kelly is a teacher who heard me speak at her school and decided she wanted to help.